Image courtesy of NASA/Johns Hopkins APL/Steve Gribben. The other evening when I took a taxi ride home, the driver said “what a hot day!” as soon as I got in. She went on to explain that she had been driving in the Sun all day. That led me to think that, if we feel so hot at a distance of 149 million Kms from the Sun, and that, inside an air-conditioned cabin, what would happen to a spacecraft that went as close as 6-7 million Kms to the Sun. NASA had just launched the Parker Solar Probe at that time. The thought left me scurrying for answers to many questions that I had about the Probe; in terms of engineering ingenuity, the Parker Solar Probe is a fascinating mission. Parker Solar Probe is a spacecraft that was launched on August 12, 2018, by NASA to research and analyse the outer corona of the Sun. The Sun’s corona is responsible for the solar wind, a continuous flow of charged particles that pervades over the entire solar system. These solar winds cause disturbances in the Earth’s magnetic field and can also affect communication technology on earth. The craft is named after Eugene Parker, a pioneering solar astrophysicist at the University of Chicago, who was the first to write about solar wind in his paper in 1958. Most people were skeptical about solar wind and dismissed it. But within 4 years, he was proven right. The craft was designed and built by Johns Hopkins University’s Applied Physics Laboratory. 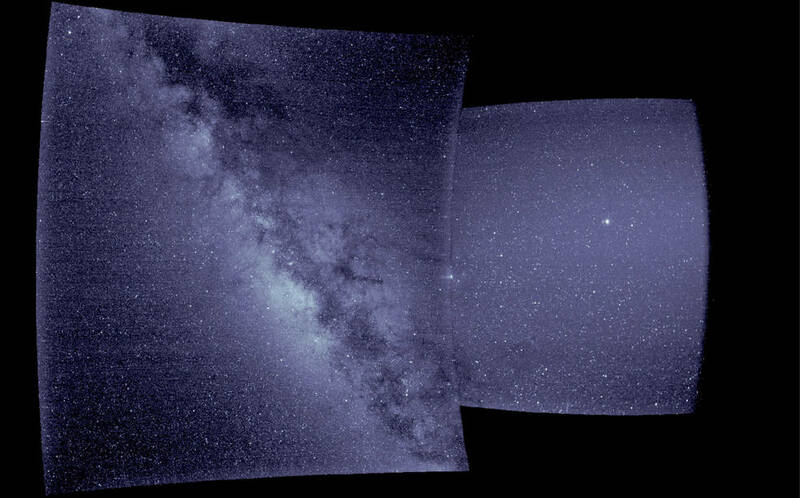 On September 20, the Probe which is on its way to the Sun, sent out its first photos from its Wide-field imager. On October 3, it made the first flyby of Venus. These are the first images from WISPR, short for the Wide-field Imager for Parker Solar Probe. Credits: NASA/Naval Research Laboratory/Parker Solar Probe. The spacecraft will use 7 gravity assists from Venus and the gravity of the Sun to hit speeds of 690,000 km/hour that no man-made craft has ever reached before. 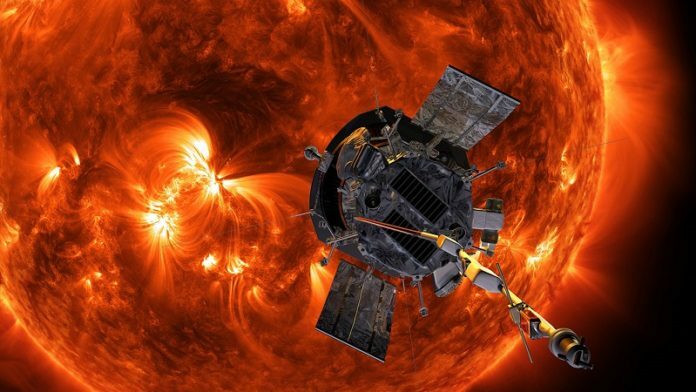 The probe will make its first pass of the Sun in 3 months after launch. It will make 24 flybys of the Sun in 7 years and in the process, enter Sun’s corona, getting as close as 6.16 million kms to the solar surface, where no craft has ever ventured before to take measurements. The average distance from the Sun to the Earth is around 149 million km. 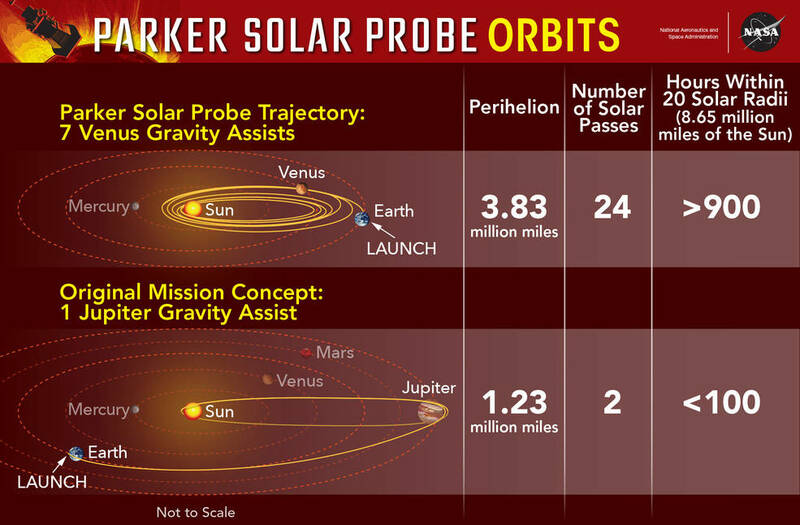 The final orbit for the Parker Solar Probe mission uses seven Venus gravity assists to rack up more than 900 hours close to the Sun. The original mission concept, using a single Jupiter gravity assist, got the spacecraft closer to the Sun, but gave scientists less than 100 hours in key areas. The solar wind starts off from the solar surface (photosphere), passes the solar corona and hits a speed of 1.45 million and 2.9 million km per hour as it reaches Earth’s orbit. Scientists believe that the acceleration happens at the Sun’s corona. Not much is known of the Sun’s corona. Coronal temperatures range between 1 million and 3 million degrees Celsius, much higher than the temperature of the Sun’s surface which is comparatively much lower around 5,500 degrees Celsius. The reason why solar winds are accelerated to such high speeds, and why coronal temperatures are so high compared to the surface, are things we have not understood. Hopefully, the probe will give us more answers. If the coronal temperatures are in the range of 1 million and 3 million degrees Celsius, how will the probe enter the corona and still survive? According to Betsy Congdon, Lead Engineer at Johns Hopkins University’s Applied Physics Laboratory, the answer lies in the difference between heat and temperature. Although the temperatures in the corona energy particles are high, the particles are not very dense. As a result of that, not much of the heat is transferred to the probe and hence the probe is heated to only a few thousands of degrees Celsius which is more manageable. It is pretty much similar to putting our hand inside a hot oven where although the temperatures are around 400 degrees Celsius our hands feel the heat but still never reach that temperature. As the craft comes close to the Sun, the side facing the Sun will be heated to about 1370 degrees, according to NASA. To protect the craft from these high temperatures, the craft uses some ingenious engineering to have a cutting-edge protector shield that is hexagonal in shape, 2.4m in diameter and 11.4cms thick made of advanced carbon composite material. The white reflective alumina surface of protector shield will reduce the heat absorption and the carbon composite material will keep all the instruments behind it at a much cooler 29 degrees Celsius. According to Betsy Congdon, the heat shield is made of carbon-carbon (super-heated graphite epoxy) front and back panels with inner layers of carbon foam that is 97% air. The shield weighs just 73 Kgs and took almost a decade to conceive and develop. How does the shield always protect the instruments? The probe itself is pretty much autonomous and can protect itself through its software. There are 4 light sensors called the solar limb sensors behind the shield that look around the edge of the protector shield. Whenever the onboard computer software senses that the probe is moving to a position where the instruments behind the shield will be exposed to the Sun, the software will work the fly wheels to nudge and realign the probe back in position so that the instruments are protected by the shield. This way the protector shield is always facing the Sun and protecting the instruments behind it. The probe uses solar panels for power, but the catch is that the panels need to be exposed to the Sun to generate electricity and at such proximity to the Sun, the panel will need special protection. The probe has 2 sets of solar panels, one for use further than 0.25 AU from Sun and the other within it. The primary power is a dual system of solar panels used when the craft is beyond 0.25 AU and retracted behind the heat shield when the probe approaches closer to the Sun. Within 0.25 AU, a much smaller secondary array is used and this array is kept cool by the circulation of water that constantly transfers the heat from the arrays to a radiator. The solar panels are optimally exposed to the Sun as needed based on the energy needs of the spacecraft as calculated and controlled by the onboard computer. The SPC, which is a Faraday cup, is one of the parts of the probe that is outside the shield, adjacent to it, and directly exposed to the Sun. It is made of titanium-molybdenum-zirconium, which has a melting point of 2500 degrees Celsius. According to Dr. Tony Case of the Smithsonian Astrophysical Observatory, the SPC’s electrical field instrument is made of two grids of fine tungsten that has a melting point of 3427 degrees C and is 90% transparent. One of those tungsten grids is a high voltage filter that deflects particles with less energy and filters the particles based on the speed of particle that need to be measured. Such filtered particles hit a metal plate in the rear of the cup to deposit their charge on the plate, where the current is measured. The wires that feed the high voltage 4000V electricity to the tungsten grid are made of niobium (melting point of 2480 degrees C) with sapphire beads insulation, since copper wires would melt in those temperatures. By Tony Case’s reckoning, at the distance from where the probe is flying, the SPC can not only take in and measure the solar wind but also the coronal mass ejections as well. All in all, the Solar Parker Probe is an amazing technological marvel with selective use of materials and cutting-edge engineering to protect it from the wrath of the Sun and its environs. 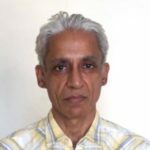 Subsequent months and years will tell the world how it performs and provide us with a plethora of information to answer questions which our scientists have had for many decades.